Ideal for fire pits and fire rings larger than 12"
Want to give your fire pit that more traditional appearance that everyone knows and loves? Well, then this log set from Hearth Products Controls is just for you. This beautiful gas log set is ideal for fire pits and fire rings that are larger than 12". 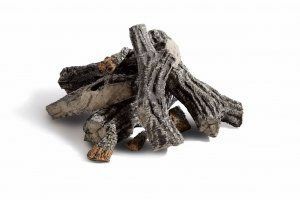 The logs are made of durable gel-cast ceramic fiber and are finished in a realistic gray and black design that looks naturally weathered from long outdoor exposure. The set contains two 10" logs and two 9" logs. Set the logs to create a natural-looking fire that evokes thoughts of old times. And make sure to cover the logs when not in use to extend their life and make your purchase all the more worthwhile. What weight is the set? Being that this set is manufactured from ceramic fiber, it has a fairly light weight of 18 pounds.